Do you get to choose which parts to embrace? A historian once said that history is a description of the path a country took to become itself. The problem with this thinking is that no country remains static. Things change over time. This then necessitates a constant re-writing of history and a constant change in what is really essential. 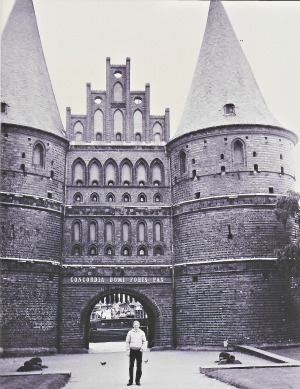 Rudi at the Luebeck City Gate, versions of which date back to 1240. During the age from 1871 to 1914 it became important to emphasize that which made Germany an empire. From 1918 to 1945 it became important to research Germany’s European enemies. After WWII and with increasing wealth, it became important to show the roots in history of German industriousness. When I grew up in Germany, we were taught History in high school. We usually started with the Sumerians and ended somewhere about 1871 because we “ran out of time” or so we were told. I can only remember one teacher who had enough time to also cover WWI and WWII. Before I came to the US, based on what I learned in school and my observations as a teen-ager growing up in Germany, I always thought that Germany was an obedient, industrious, hard working country with a pretty glorious past. WWI was an aberration and certainly WWII also, including the Holocaust. Much later did I revise my understanding about German history. It should not be our interpretation of what was important and what was not. It is a telling and retelling of everything past, whether we like it or not. So now we must say that the Cologne Cathedral and the Holocaust as well as the recovery after WWII are a permanent part of German history. Anytime I broach this subject with Germans who remained in Germany they want to say the bad times were the short years from 1933 to 1945. Germany was led by a madman. It is better that these times are forgotten. Well, if you don’t learn from the mistakes in history, then you are bound to repeat them. In Stumbling Stone, the German-born Karl Schmidt comes to a similar and profound realization about his relationship with Germany history.